When I was young, maybe 15 years of age, there was a place called Mr. Wiu, just a few hundred meters from my house. It was my first experience with Asian food. I remember it so well, sweet and sour pork, Gong Bao Chicken or spring rolls. I grew up eating them. Even though we had many local fast food restaurants in my neighborhood, this one had “something” that bought us for life. Tastes were amazing and sweet, and sour mixes blew up our teenage minds. Even then, I have seen that Asian food is prepared in some steel "plate, " but just after few years, I have realized that main tool in the hands of Mr. Wiu was the carbon steel wok. What to look for when choosing wok for your kitchen? What have I concluded at the end? As we remember it from some Asian movies or from local Chinese fast food restaurants, the carbon steel wok is usually round bottom vessel, used for stir frying, steaming, deep-frying, and poaching. It originates from China but nowadays is used all over the world for the preparation of Asian cuisine. Woks used in China usually have rounded bottom because they are used on gas stoves, and they are never placed down on the cooking surface. Since we live in “modern” times, woks today have the flat bottom for us to be able to put them down on our gas or electric﻿ stoves. During cooking, wok bottom gets extremely hot, allowing you to quick sear ingredients in oil and then push them to wok sides while you cook remaining ingredients. In the end, with a quick move of our wrist, you mix them all together. Two most used materials for wok production are carbon steel and cast iron, but we can find ones made of ﻿stainles﻿s steel covered with the non-stick layer or from aluminum. The ones made from carbon steel are widely used. What is also good about them is that they are light, easy to lift (have in mind that when used, wok full of vegetables and meat is quite heavy). Carbon steel is also very good conductor of heat meaning that it will heat up quickly. Cast iron woks are less prone to sticking of food, but the ones produced for US market are quite thick (almost 9 mm), making them seriously heavy for cooking. The downside of using cast iron is that this material responds slowly to temperatures adjustments, so food prepared in this type of wok should be removed immediately after preparing to avoid overcooking. and 16" for over 12 people. It is best to choose based on your experience with a number of people you are having for lunch or dinner. I decided to test 14 inches carbon steel woks since their size can fit our regular family meal but can also be used when we have guests. Woks do not have many features. The main “thing” the wok must have is a handle. Main wok handle is long and similar to standard pan handles and it is called “stick” handle (check out the Red Copper Pan). Second handle is called “helper” and it is located on the opposite side of main one (like the Copper Chef set). The carbon steel wok is specific, and you have to follow some rules before using it. There are two reasons for that, one is that you need to remove factory protective coating prior to cooking and the other one is that seasoning will act as natural non-stick coating and will protect carbon steel wok from rusting. Every wok should be thoroughly cleaned before first use. What I did is I filled 2/3 of every wok with water and boiled that water for approximately 8 minutes. After that, I used a soap and scrubbing pad and scrubbed vigorously inside and out to remove every single piece of a protective coat. Immediately after that I have rinsed wok into the water and wiped dry. This step is of utmost importance for wok and your future cooking in it. Adequate seasoning will prevent sticking of food to wok surface and will act as non-stick coating. For this purpose I have used two tablespoons of cooking oil, rubbed them onto wok’s interior. Then I placed wok on my ﻿electric stovetop and heated it on medium heat for 10 minutes. During heating, I have used a paper towel to distribute cooking oil evenly on the inner wok surface. What is also important, I tilted the wok upside down to heat the complete inner surface evenly. After ten minutes I removed the wok from the stove and let it cool for ten more. I repeated this process three times to make sure that my wok is properly seasoned and ready. I decided that this has to be a real test. Reviewing others experiences of the most probably oldest utensil used today, would not be fair to thousands of years of its history. But, this time I also involved my husband. He is quite a good cook when it comes to Chinese food, so aside from advice from another "chef," I will also have male insight, which I do not often have. We bought following five carbon steel woks, and after we tested them, one stayed in our kitchen and others will be shared with our friends and family. And for sure I needed someone strong to scrub and clean factory coating before initial seasoning! So it's Asia time in Barbara’s home! This carbon steel wok is standard family size wok, meaning its 14 inches in diameter, more than enough for the whole family. It’s made from carbon steel, and it's light and easy to lift. Joyce Chen Pro Chef Wok features the flat bottom, to be used on gas, electric and induction stovetops. According to "real story," Joyce Chan opened her first restaurant back in 1958. And her woks are a result of her pursuit of perfection when it comes to wok cooking. 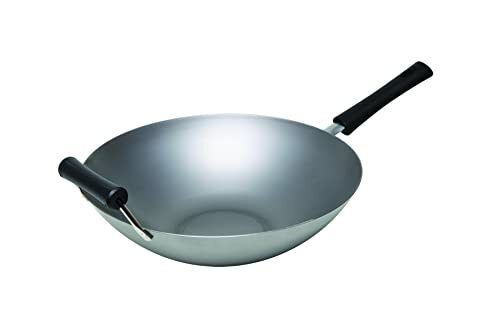 As standard, this wok has two Phenolic handles, which will stay cool during any wok usage and they are easy to remove, which is quite good for cleaning. As producer recommends, this wok should be manually cleaned with water. If you have some burned food on your wok, it is recommended to scrub it with scouring pad and hot water. Before storing, you should apply a light film of cooking oil to prevent rusting. If you, somehow touch inner surface with sponge and soap, clean the soap with water and re-apply seasoning. After I had done seasoning, cooking was seriously easy. My mixed vegetables and pork meat were excellent, tasty and somehow fresh. I cleaned this wok super-fast, just with hot water. If you would like to give wok as present to someone, this would be a perfect choice. It comes very nicely packed and with all features included – lid, spatula and recipes book. It’s made out of 1.6 mm carbon steel, and it is within average weight of wok. It features flat bottom design so it can be used on any gas, electric or induction stove. Concentric grooves of carbon steel are visible, and they are providing rapid and constant heating and cooling of this wok. This wok features two handles – one main “stick” handle and one helper handle. Both handles are made from wood, and they look very nice and in line with ancient wok tradition. This carbon steel wok also features doomed metal lid. As I have mentioned, this wok is 14 inches in diameter, meaning family size – its capacity is more than enough for a family of 4-6. I did cleaning as recommended, using soaking in hot water for five minutes and then used clean water and sponge to remove the food residues. As all woks, this one also requires initial seasoning. I used it to prepare soup and boiled rice with vegetables and eggs (also check out some of the best egg cookers here). For soup it was perfect. For rice, it was quite ok, but it heats up fast, and if you are not careful, you will not avoid sticking of rice to your wok. It looks a bit shallow for the preparation of a meal for 5-6 people but for a family of four is just about right. This model came to me, and I noticed its simplicity and nothing else. Nothing to impress me when I touched it. It's made of carbon steel, size 14 inches. It has two wooden handles, the main one and "helper" one. Nothing special. It's around 4 inches deep which will provide you with enough space to cook rice, vegetables, and meat for four persons. It came packed nicely, and initial cleaning went quite smooth as well as seasoning. The main handle is not attached to wok for easy transport but it super easy to attach it to wok once you unpack it. It has the flat bottom so it can be used on any electric, gas, or induction stove. Surprisingly, cooking was fun and smooth. After proper seasoning, I used scallion’s leaves that I bought on Korean market and stir-fried them. They came out just perfect, a bit bronze but just the way I wanted. After stir-frying washing was inevitable. I used hot water and a clean sponge. Boiled water for few minutes and just removed residues with a sponge, and it was done. Oiled it a bit more and stored. This carbon steel wok comes with all the things you might need even if you are novice in the kitchen. 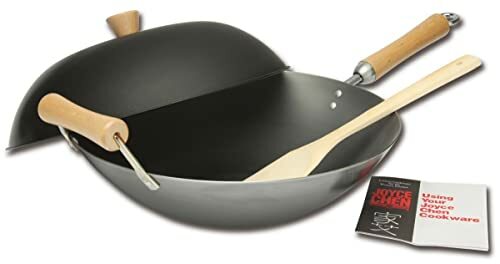 As soon as you unpack the wok, you can start cooking since the package includes 14 inches wok, dome lid, 12 inches bamboo spatula and book with recipes. More than enough to start immediately! The wok is made from 1.5 mm carbon steel, and it provides fast and even heating on whole wok surface. Its size is enough to prepare a meal for a big family. Design features two birch wood handles, one main and one "helper". For better usage of the wok, the producer also provided the lid with non-stick coating and knob on top of it. This cover will keep heat, moisture, and nutrients and all of them are important for the final result. As any other wok, this one also requires seasoning as I mentioned before. After initial cleaning and seasoning, I stir-fried bok-choy (for all of you who never used this one it looks like cabbage) with ginger and garlic, with just a little bit of cooking oil and two spoons of soy sauce. The meal ended up very sweet, crunchy and fresh. Cleaning of wok after soy sauce was easy, I just boiled a bit of water for few minutes, and it came off quickly. The same as all others, this wok is made out of carbon steel in size f 14 inches, which should provide you enough space inside wok to cook for your family. The material will provide fast and constant heating of the complete surface. A small thing that differs this wok from others are handles. This one has plastic ones. They do not look so nice, and they are not in Asian style, but they are staying cool during the whole time. The flat bottom will allow you to use it on, any modern stove. What I have found out important for this wok is that it would be good to place it on high heat after cleaning. It will smoke and burn some factory residues. Initial seasoning is a must, like with all other woks that I was using. Seasoning of this one took me a bit longer until I was satisfied. It took around 45 minutes for me to be sure that it is seasoned properly. I used it to stir-fry mixed vegetables and meat but with particular attention to the onion. I wanted to get delicious brown onion, which is almost sweet. It tasted good, but cleaning was a bit of a nightmare. In the end, I ended up scrubbing residues, and then my wok needed seasoning again. Let me just emphasize few things that I was considering with my husband before we have decided which model is the best for us. As you have noticed, initial seasoning and cleaning are seriously necessary. You also need to have in mind that rusting of the wok is a standard process, so if you treat it correctly this would not be a problem. Another thing is that we did not consider the price during our discussion. Price difference among tested woks is slight, so it should not affect your choice, and it did not affect ours either. As for our decision, we think that our winner is Helen Chen's Asian Kitchen 14-inch Carbon Steel Wok with beautiful wooden handles. It's made from carbon steel, has the high lid which we use for steaming and has beautiful wooden handles. Hi there,I read your blogs named “Best Carbon Steel Woks 2017: Top 5 Recommended and Reviews” like every week.Your story-telling style is witty, keep doing what you’re doing!